Ironman athletes log hundreds of hours training and preparing for a great performance. Every Ironman athlete knows the race is about being able to cover the distance as quickly and efficiently as possible. Every Ironman also knows that there is a point in the race where everything becomes very challenging. If your goal is to do more than just cross the finish line, a few key shifts need to happen. You may already be doing these things, but if not, these will help you get the most out of your Ironman performance. 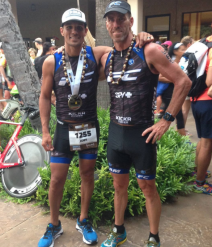 Each year I help dozens of athletes race faster and stronger at the Ironman and Half Ironman distance. Almost every single athlete I coach has “time available” as a key limiter; time to train as well as time to recover. My approach (The FC Method) is different, yet very effective. The major focus of the FC Method is to help an athlete develop sport specific strength and speed before focusing on endurance. Big gear work, power intervals on the bike, short fast runs, hill repeats, paddle work divided into very short intervals, and some total body strength mixed in. My goal is to make an athlete resilient, durable and well balanced before we start heading out on 4 and 5 hour rides and long 2- 2.5 hour runs. There are five phases that all my athletes go through. The Foundation, Pre-Competitive, Build, Race Prep, and Rejuvenation. How long I spend focusing on each phase depends on an athlete’s goals, history and time until race day. My Kona bound athletes or athletes with a history in the sport will spend up to 16 weeks in the Foundation. More endurance is NOT the way to get faster. Endurance is important, but it’s not what slows an athlete down in an Ironman or half Ironman. Lack of leg strength, durability and resilience is what causes an athlete to fade. Focusing on strengthening the areas that contribute to your slow down will yield amazing results.